A majority of consumers were amazed at how comfortable the Nike Free x Metcon was. CrossFitters were impressed by its versatility and ability to keep up with various WODS. Multiple buyers adored the trendy design of the shoe, which made it stylish enough for casual use. Plenty of reviewers liked the snug fit of the upper, which prevented accidental heel slippage. Many fitness enthusiasts appreciated the support that the midsole provided. The model received a myriad of compliments for its flexibility. People with plantar fasciitis enjoyed the pain relief that they experienced while wearing the footgear. Some budget-conscious wearers found the $120 price tag to be reasonable for such a quality shoe. A few weightlifters complained that the footwear had insufficient support for heavy loads due to the flexible and cushioned midsole. Several critics were annoyed by the shoelaces as they got untied easily. A small number of quality issues have been reported; they included the low-quality back strap and the outsole getting destroyed easily during rope climbs. 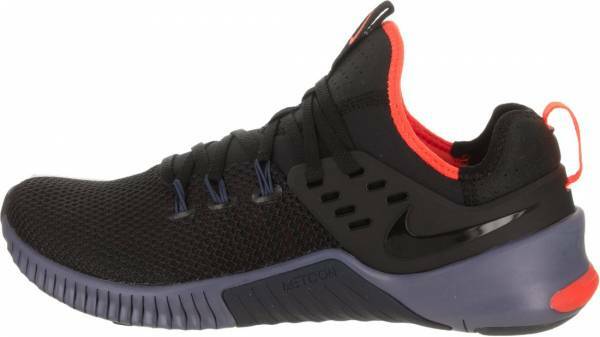 The Nike Free x Metcon received a lot of hype from the CrossFit community for its comfort, versatility, flexibility, and the stability which the Metcon line is known for. Other highlights included the pleasing aesthetics and the sock-like fit of the trainer. However, it still earned the ire of a couple of testers for not being stable enough for heavy weightlifting along with a few minor gripes. In conclusion, this Metcon version was still deemed a great CrossFit and everyday training shoe by scores of physically active people. In my book, these are must buy other than Nano 8s. They are a nice addition to the Metcon series. I think they're extremely comfortable and I wouldn't mind doing my weightlifting in them. But when it comes down to performance or competitions, I don't think they are going to be replacing the Metcon 4s or DSX Flyknit 2s. For those interested in a comfortable shoe for getting in the casual workout, then reach for the Nike Free x Metcon. In my opinion, if you want a shoe that’s comfortable to wear every day, and also perform functional fitness workouts in, then this may be your best bet. The Free x Metcon is the first shoe in which Nike fuses two of its prominent footwear lines: the Free and the Metcon. While the Nike Metcons have proved themselves to be hard-wearing and stable CrossFit shoes, the Nike Free trainers are designed with flexibility and natural running motion in mind. The marriage of these technologies is meant to address one of the most common demands coming from CrossFit aficionados - a shoe you could lift, run, and jump in. The trainer employs a bootie-style collar which hugs the ankle securely. The collar and the heel of the upper are made us cushioned neoprene for enhanced fit and comfort. The forefoot comprises of a TPU-faced mesh which also fits snugly but also offers flexibility and aeration. The rearfoot area is wrapped in TPU sidewalls which aim to enhance support and durability. The Flywire technology works together with the lacing system for a secure yet dynamic fit. It locks down the foot and prevents accidental shoe removal. A dual-density midsole is utilized in the shoe. It is a combination of the cold fusion technology in which a plush foam is installed in the center for underfoot cushioning, and a firm carrier at the back for support. The rubber outsole is patterned in laser-siped flex grooves that foster natural foot flexion. Low-profile heel clips are lodged into the lateral and medial sides to help with handstand push-ups. A durable rubber compound guards the midfoot. It protects the footgear from abrasions during rope climbs. The Nike Free x Metcon is a CrossFit shoe that is engineered to suit the feet and biomechanics of men. It is available in a wide range of sizes, from US 6.5 to 15. Widthwise, it only comes in a D - Medium width option. The bottom of the Nike Free x Metcon is made from two types of rubber. One is the carbon rubber which is one of the most durable types, while the other is blown rubber that lends a cushiony and lightweight feel to the outsole. It uses the Nike Free technology which is comprised of laser-siped flex grooves for seamless lateral movements and flexibility. The tread features tri-star patterns, some of which are compressible and some are rigid to render a combination of support and pliability. The inner midfoot is wrapped in a rigid block of TPU and rubber. It guards the footwear against the abrasions and friction caused by rope climbs. Smooth low-profile heel clips are located in the lateral and medial sides of the outsole. They reduce the drag from the wall during handstand push-ups. The Nike Free x Metcon employs a dual-density midsole. It features a soft compound which is housed in the firmer one with the use of a cold fusion technology. It is meant to balance plush comfort and stability. The Nike Free x Metcon sports a bootie upper that is made of mesh covered in TPU. It is engineered to provide flexibility, support, breathability, and durability. The mouth and the heel area are made of neoprene, which is a breathable, smooth, and cushioned material. TPU sidewalls wrap around the midfoot for lateral support. They keep the foot centered in the midsole during side-to-side movements. They also have holes that serve as eyelets, enabling the tester to adjust the tightness of the footgear. A traditional lacing system is used for a secure foot lockdown. It works with the Flywire technology, a set of filaments that operate like cables on a suspension bridge. It delivers support and snug fit. Along with the wide array of color options, the Free x Metcon keeps getting released in newer editions to inspire athletes and help them complete the look. With its metallic, anthracite, and cedar brown hues, this colorway creates an image of a venturous, powerful, and fearless warrior from the North. As the name suggests, this edition is offered in patriotic coloration to pay homage to the motherland. A vibrant gym blue upper contrasts with a white platform and red Flywire eyelets, representing the colors of the US flag. The PU five-pointed stars can be seen on the apex and the heel collar. A red pull tab at the back also features two white stars which light up when hit with a ray of light in dark conditions. The insert inside completes the look with red and white stripes.